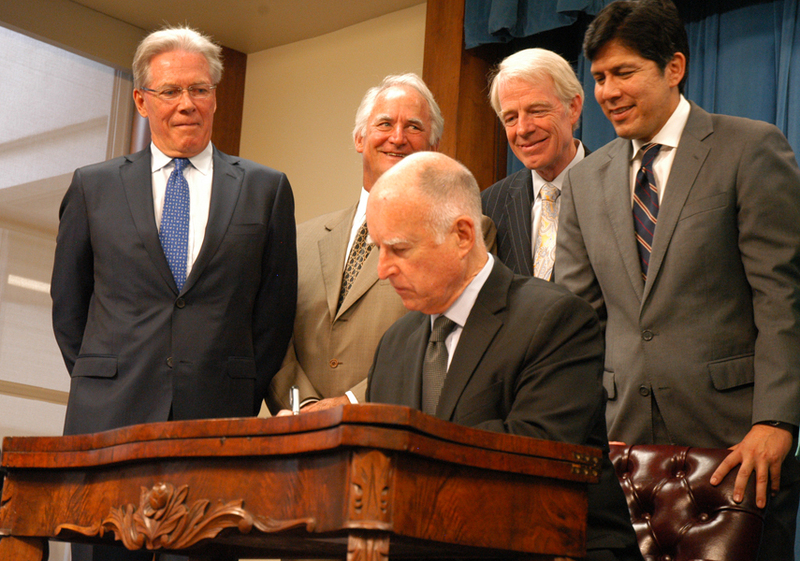 At the Sept. 16 signing ceremony for California’s landmark groundwater legislation, Governor Brown is joined by (from left) State Board of Food and Agriculture President Craig McNamara, Board Member and Driscoll’s Chairman Miles Reiter, Assemblymember Roger Dickinson, and Senate President Pro Tempore-elect Kevin DeLeón. I am signing AB 1739, SB 1168 and SB 1319, which taken collectively establish a new structure for managing the State’s groundwater. These bills accomplish a number of goals described in the California Water Action Plan, a five-year plan to sustainably manage our water resources. When combined with other elements outlined in the plan — conservation, water recycling, expanded storage, safe drinking water, wetlands and watershed restoration — and the passage of Proposition 1, we can take giant strides to secure California’s water future. A central feature of these bills is the recognition that groundwater management in California is best accomplished locally. Local agencies will now have the power to assess the conditions of their local groundwater basins and take the necessary steps to bring those basins in a state of chronic long-term overdraft into balance. The State’s primary role is to provide guidance and technical support on how to plan for a more sustainable future and to step in on an interim basis when, but only when, local agencies fail to exercise their responsibilities as set forth in this legislation. My administration will work closely with all affected groups to ensure that the statute is fairly implemented. Further, I will submit for legislative consideration during the next session a proposal to streamline judicial adjudications of groundwater rights. This entry was posted in Climate Change, Drought, Environment, State Board of Food and Agriculture and tagged Craig McNamara, Governor Brown, Groundwater, Miles Reiter, State Board of Food and Agriculture. Bookmark the permalink. This is a huge over-reach by the Governor–signing a bill that was rushed through the last Legislation session at the very last minute. There was no review, or vetting and the bill addresses way more than managing over-draft situations. Lawyers should start lining up for endless years of litigation! I agree the bill was rushed. There seems to be no attention to revising or updating California Well Standards that were last addressed in 1992. Remember groundwater is accessed through wells that may be screened through multiple aquifers of varying quality enabling cross contamination of aquifers. We need to protect the quality of groundwater through new well drilling standards. When it rains, it pours and we are not concerned with dwindling fresh water resources for a while. With drought, especially the real possibility of prolonged drought, a new water source that is readily available is needed. We need to use the ocean as a bulk source of water which can be processed into potable water. Short range, shoot for 10% de-sal by 2025. Long range, 40% de-sal by 2040. All newly developed commercial, residential and industrial properties need to be dual pipied for salt water and potable water. Salt water is used for flushing. Sewers are common, treatment plants handle the salt water brine (nearly no change at first). We need to push this whether we have wet years or dry years. Population increase is far more reliable than annual rainfall.